Sunday morning came way too soon, so I missed the first part of the delegates meeting. If you want the blow by blow details of Sunday's session check out John Hillary's live blogging. A typical Sunday session is just trying to get through the printed agenda. That usually means referring a lot of motions to committees. We did make a change to the 14H insufficient losing chances rule. The discussion was totally confusing and I'm not sure we really knew what we were voting for. Judging from the posts this week on the USCF Issues Forum, we probably got something we didn't intend. I'm not even going to begin to attempt to explain it. We did manage to finish in time, and I was able to grab a bite to eat before round 9. It's been awhile since I last came into the last round with an even score. Not that I was particularly happy with how I have arrived at that even score. Somehow 2 wins against 1100s, 2 losses to an IM and a kid rated 1300, and 4 draws against 1300s and an unrated was not what I call a stellar performance. I would have been more satisfied with my result if I won the games when I was paired down, and lost the games when paired up. Finally in round 9 I would get paired up for only the second time this tournament. It is often said that a picture is worth a thousand words. The picture below conveys just how I felt at the moment it was taken. Zeljka Malobabic of Mon Roi took a picture of me almost every day. I'm smiling in the pictures from the earlier rounds. In this picture I'm looking rather grim. Judging from what I can see of the board this was taken shortly before I got my bishop trapped. Here is the game. It was kind of typical of how many of my games as White have been going. Maybe it's time to learn some real openings and play 1. e4. During the tournament I met Eric Strickland, aka ES_Trick. Finally on the last day I got somebody to take a picture of us together. It took numerous attempts to get a picture that was in focus. It seemed every person I asked to take a picture could not figure out how to use my camera. 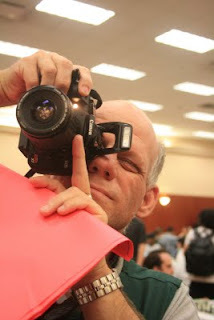 Finally I got Chris Merli who has the same camera to take the picture. Going into the last round there were two players at 7 points. Alex Lenderman and Sergey Kudrin had a hard fought draw. This created the opportunity for players at 6.5 to tie for first if they won. 6 players ended out in the tie. Sergey Kudrin and Dmitry Gurevich were the top two on tie breaks. They had a one game Armageddon match to determine the champion. Who says chess isn't a spectator sport? Gurevich had Black with draw odds. How frustrating must it be as White to have to force three fold repetition for a draw that loses the championship? Here is the crucial position. White just played 29. Bf6+ the game continued 29... Nxf6 30. Qxf7+ Kh8 31. Qf8+ Kh7 32. Qf7+ Kh8 draw. Just because the tournament games were over didn't mean the fun and games were done. Every night there would be an energetic group of teenagers playing blitz and bughouse until all hours of the morning. Since it was also the spot where I could get free internet I would often hang out, and catch some of the action. Zeljka catches me in blogging mode. Some of the night owls. They had a very interesting bet going on. The guy on the left in the striped sweatshirt bet them that he could drink a gallon of milk and all the extra cups sitting in front of him in an hour, and keep it all down for another hour. I'm not sure what the final outcome was. I would have had to stay up until 3:00 am to find out. As it was I had to catch a 5:30 am train back to Chicago. I wasn't about to pull an all nighter with the kids. When I did pass by there at 4:30 am there were still about 4 people playing blitz. More of my games can be found at Checkmate State by State in this post or at MonRoi.com. I got back to Chicago on Monday morning. That evening I had dinner at Jerry Neugarten's house in Highland Park. I haven't seen him since he moved out the Chicago area. We were joined by ICA President Tom Sprandel and Glenn Panner and his wife. Even though my husband does not play chess, he managed to survive an evening of chess geek talk. I finally got home on Wednesday and keep things consistent, I had another flight delay. Fortunately it was only Mother Nature messing with the New York airspace, not some nut job with a fake bomb. Unlike the poor folks who spent the night on a plane with no functioning toilet, we only sat on the tarmac for an hour. I've gotten everything unpacked, and the laundry done. This is just a brief pause before I take flight again. So what does one do after accumulating tons of frequent flier miles, and hotel points? Take another trip using them. Next stop London, then on to the Netherlands to see my best friend who lives there. I don't know if I'll do any chess in London. I'm making a few inquiries but all the clubs seem to meet on days when I won't be there. However I will be meeting up with Tempo and CMoB in Amsterdam to go to a chess cafe. There is also the NH Tournament: Rising Stars vs Experience. Hikaru Nakamura will be playing in it. I hope I'll get a chance to catch some of the action. My friend that I'm visiting over there is the one who taught me how to play chess 41 years ago. Once I return from that trip my travels will come to a grinding halt. With the exception of a visit to my sister's and playing in the NY State Championship over Labor Day, I'll be laying low. Teaching and directing will be be next on my agenda. You are my chess hero! I think it is amazing how much you go out and play and teach and direct!! I am completely serious. You are a true competitor and a true lover of the game. You make me feel lazy that I don't get to more tournaments. But I am happy to say that I went to 4 tournaments in 2008 and upped that number to 6 in 2009 and the year is not over yet! Good luck in the NH tournament and have fun in Europe! I'm not playing in the NH tournament. It's a tournament for grandmasters. I do plan to go watch one of the days. 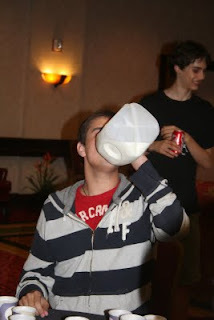 I wonder if the boy won his milk bet? We all have bad tournaments from time to time but i find it kinda disturbing that your bad streak is so long already. Do you only play and no study or analyse? Tiger: I admit it. I play too much, and don't study enough. But it's also in my mid too. I have to be more optimistic in my view of certain positions. I Added more games at www.checkmatestatebystae.blogspot.com. Anon: Yep. Mac Book. Though I have Parallels on there to run Chess Base. Out there Amtrak is cheap. My trip ticket from Chicago to Indianapolis and back was $38. On the Northeast corridor I can barely get to Newark airport for that little. Amtrak out east is so damn expensive. Flying to Indy from Chicago would have added another $125 to $150 to the cost of my flights. It was a very pleasant train trip. It sure beats flying. Polly, it doesn't take much time to study a book on tactics that is all diagrams, like say 10 problems in 30 minutes or less. You could do that while sitting in the airplane. That round 1 game, you have 32. Qc1 instead of BxB. It's called "Alekhine's Gun" to line up the queen on a file behind the rooks. Best Black has seems is ...Nd5 giving you the exchange and what should be the game. 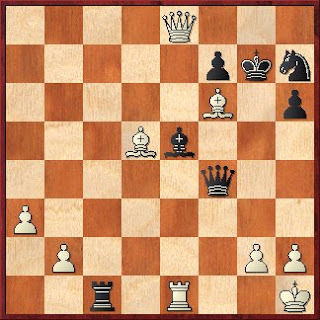 Otherwise, you would simply play Nb1-d2-b3-a5-c6, if Black doesn't play Nd5. You also have Nb1-d2-e4-c5. Should be an easy win, I think. More important than "studying", keeping the tactical eye sharp is a virtual must the higher your ratings goal. Enjoy your trip to the Netherlands. I also hope to be at the NH Tournament: I've attended them all so far. 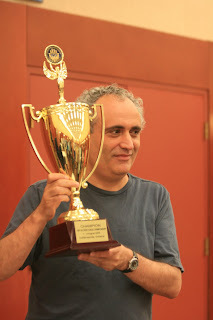 It sort of pushed me back into chess, as I had never attended a chess tournament before ! I met John Nunn the first time, and last year Simen Adgestein and at least I saw Victor Korchnoi !! Hope you enjoy your chess cafe visit ( Laurierboom ? ). Its great that CMOB is back- a v amusing blog. Say hi from "Too Shy" and buy him a Starbucks ! Prost: I will certainly relay your message to CMoB. Maybe we'll cross paths at the NH tournament. Prost: We are meeting at the Laurierboom on Saturday Aug 29th if you care to join us. Tiger: If you can make the trip from Belgium, feel free to join us too. Not sure if I can make the Saturday cafe, as a night out was already planned ! Apart from Laurierboom, another interesting cafe is Cafe Batavia 1929. It is just opposite Centraal Station to the left of the Cathedral ( and next to the Ajax supports cafe !). Much improved over the years, even hosts proper tournaments and chess 960 ! Too Shy: Thanks for the tip. Maybe I'll check that out too since close to the train station.